Mother Jesse Michener of Tacoma, WA walked into her home after work on June 19th to find her two daughters had both severely sunburned that day while at school. Michener’s daughters Violet, 11, and Zoe, 9, had spent the day outdoors for a school field day. While it rained in the morning, by noon the sun was out and students rushed outside to play. Being under the mid-day sun, when the sun is strongest, the girls began to burn. Horrified, Michener immediately marched into the principal’s office only to learn that the school cannot allow sunscreen use on students due to a statewide policy and for liability reasons. The same policy exists in 49 states –preventing most students from applying sunscreen at school. The law exists due to the additives in lotions and sunscreens that can potentially cause allergic reactions and sunscreens are regulated by the FDA as an over-the-counter drug. Exception is only granted with a written physician’s note. At the moment, California is the only state that allows students to apply sunscreen at school without doctor approval. Michener’s daughter Zoe is extremely sensitive to sun due to a form of albinism. 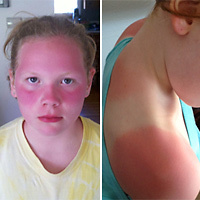 Even though school staff were aware of Zoe’s condition, she still was not allowed to use sunscreen. Since Michener posted, this policy has received attention from media outlets across the nation, including the Today Show on NBC. Schools also have started discussing the current sunscreen/over-the-counter drug policy, and begun pushing revisions. What would you have done? Share your thoughts about sunscreen use in schools on our Facebook page! 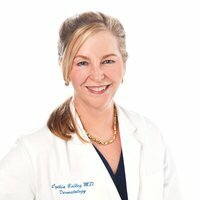 Board Certified Dermatologist Dr. Cynthia Bailey tells you how to avoid sunburn and make the most of your Memorial Day Weekend. Memorial Weekend traditionally marks the unofficial opening to sunburn season and the Friday before has been officially declared Don’t Fry Day. It’s a preemptive strike to put sun damage front and center in your mind. The National Council on Skin Cancer Prevention wants you to be sun protected; they want you to practice sun safe behavior, teach it, talk about it, and make it as American as apple pie. From now until mid-October I’ll see sunburned skin in my office, at the grocery store, walking around town, and everywhere I go! You know from experience that it’s so easy to “forget” sun protection or to lose track of time at a graduation, wedding, BBQ, softball game, pulling weeds in the garden, etc. It’s why you need to expect it. You’re going to end up in the sun longer than you think, so you need to always be prepared in advance. Apply broad spectrum SPF 30 or higher sunscreen. Wear sun-protective clothing to cover your skin. Wear a broad-brimmed had (not visor or ball cap). You also need to know that it takes extra resolve to sun protect. Culturally, sun bathing and tanning have been associated with a sense of well-being and the good life. It’s even addictive. I know; I was an addicted tanner until the big reality check that came in my dermatology residency in San Diego: cutting off skin cancer after skin cancer on people just like me. (Click here to read my story Tanning Addiction: Dermatologist’s Personal Story.) A lot of people still haven’t gotten “the memo” and justify their “actinic indiscretions” in the name of vitamin D. Sadly, it’s job security for my kind, so don’t do it. Heavy-hitting organizations have taken up the charge to change Americans’ behavior. Groups like the American Cancer Society, National Cancer Institute, US EPA, and other federal departments have teamed up to get sun protection front and center on your mind this summer. It starts with Don’t Fry Day and the Memorial Day weekend. See the team that makes up the National Council for Skin Cancer Prevention and No Fry Day. If you’re an educator, sign up for the EPA’s Sunwise program to get educational resources for your classroom and a chance to win a real-time TV monitor and other teaching aids for your class. 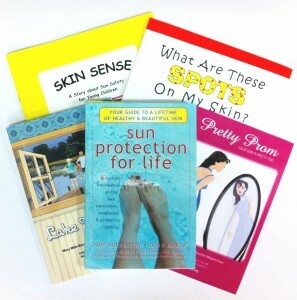 You can also find additional educational resources at SunAWARE.org. Have a happy Don’t Fry Day! Remember the broadspectrum SPF 30+ sunscreen! 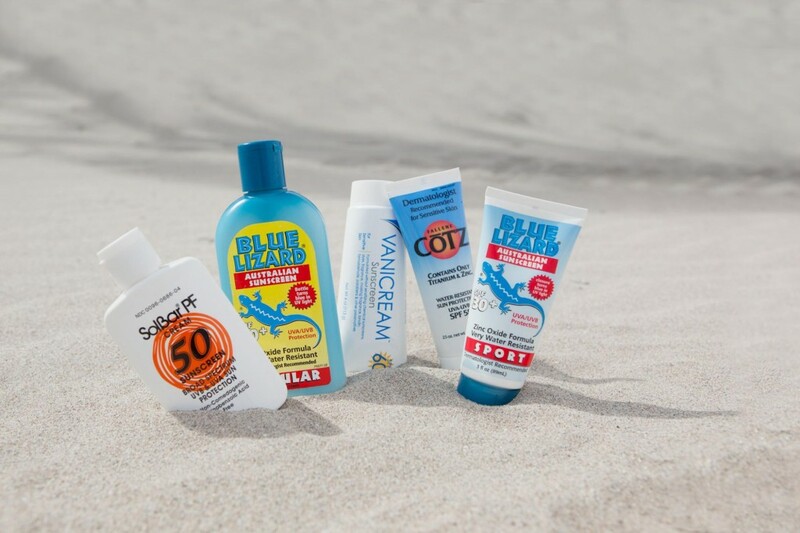 Stock up on sunscreen before Memorial Weekend. Coolibar is offering 15% off all CoTZ sunscreen for a limited time only! Consumer, beware of misleading sunscreen labels in your local drug stores this summer. Last Friday (May 11, 2012) the Food and Drug Administration announced it will no longer force sunscreen manufactures to change their labels to better inform consumers by June 18, 2012. Manufactures now have until December 2012, a six month extension, and smaller manufactures will have as long as December 2013. The decision to extend the deadline stemmed from a concern that sunscreen demand would outweigh supply of sunscreen if bottles had to be removed from shelves due to inaccurate labeling. This gives sunscreen manufactures more time to change over to the new guidelines without diminishing supply. Over the summer, expect to see labels that state “waterproof”, “sweatproof” or “sunblock”, even though dermatologists claim them to be misleading. Board Certified Dermatologist Jamie Davis, M.D, says, “No sunscreen blocks 100% of ultraviolet radiation from the sun, so calling it sunblock provides a false sense of security to consumers. Also, the SPF rating on sunscreen only rates UVB (burning) rays, not UVA (aging) rays. 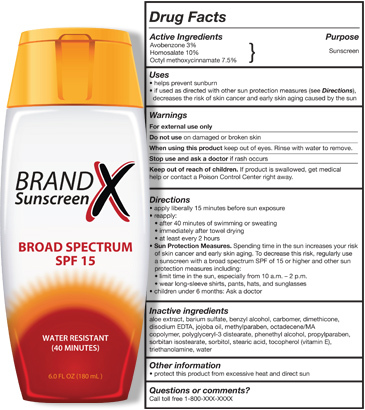 Consumers will need to look for labels that state ‘broad spectrum’ on the bottle for UVA and UVB protection and at least a sun protection factor (SPF) of 30 plus to prevent sunburn and skin cancer.” On new labels, only sunscreens with an SPF 15 or higher that also pass a broad spectrum test will be able to claim “prevents skin cancer”. A mix of old and new labels will appear on the shelves throughout summer as some manufactures have already changed their labeling standards. To protect skin, Dr. Davis recommends purchasing sunscreens that are SPF 30 or higher, broad spectrum and water or sweat-resistant. Also look for active ingredients zinc oxide and/or titanium dioxide. Apply at least a shot glass full to exposed skin (not applying enough is a common mistake). Continue to reapply throughout the day. For the best protection, members of the American Academy of Dermatology recommend using sun protective clothing as the primary form of protection in the sun including a wide brim hat, sunglasses and clothing with an ultraviolet protection factor (UPF) of 50. Disclaimer: The information provided by Coolibar and its contributors is general skin care information and should not be a substitute for obtaining medical advice from your physician and is not intended to diagnose or treat any specific medical problem. Limiting ultraviolet radiation exposure along with other changes in a person’s lifestyle such as quitting smoking, being physically active, and eating a better diet may reduce the risk of developing most types of cancer. But what about those who are in mid-battle of fighting off cancer, in any form? Sun protection is not only important for cancer prevention, but those in cancer treatment especially. The need to limit sun exposure is not always at top-of-mind when someone is going through cancer treatment, so both health care providers and patients need to be SunAWARE. Today, approximately 12 million people alive in the United States have had some type of cancer, according to the American Cancer Society. Some of these people are cancer-free; others still have the disease. Skin can become extremely sensitive during certain types of cancer treatment. 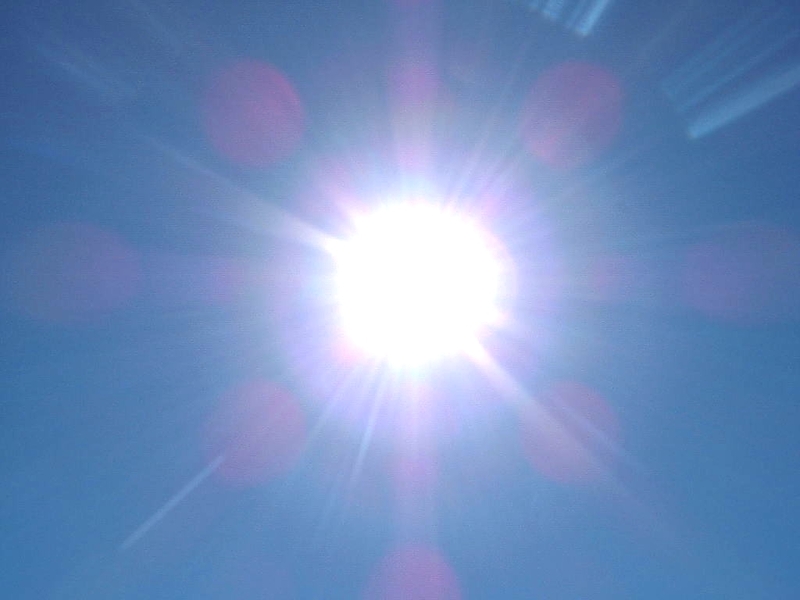 Oftentimes drugs used in cancer treatment may make skin more sensitive to the sun. While patients should always seek professional advice, using broad-spectrum sunscreen for sensitive skin every day can help ease skin irritation and prevent skin damage from the sun’s ultra violet radiation. UVA has the ability to travel through most home and car windows unless they’ve been specifically treated to block UVA. When spending time outdoors, patients should wear a broad-brimmed hat, long-sleeved shirt and long pants. Sun protective clothing that provides cooling sun relief is widely available today and can be found through a simple internet search. To stay comfortable outdoors, look for technical fabrics that offer a high ultraviolet protection factor (UPF) rating (UPF 50+ is the highest rating available), wick moisture and feel soft to the touch. In order to help spread the message about the importance of sun protection Coolibar will be visiting the Annual Oncology Nursing Society Congress in New Orleans, LA May 3 – May 6, 2012. Coolibar hopes to help oncology nurses recognize the need to communicate the importance of sun protection to patients to help ease skin conditions, provide comfort, and prevent skin cancer occurrences. Oncology Nurses: Stop by booth number 918 to see Coolibar. “Tanning is beneficial to your health,” claims tanning salon owners and employees when the House Committee on Energy and Commerce undercover investigators called 300 tanning salons nationwide. This false claim may not fool many sun protection advocates, but the rest of the U.S. population could be easily led to believe that tanning is good for you. In actuality, nothing could be farther from the truth. 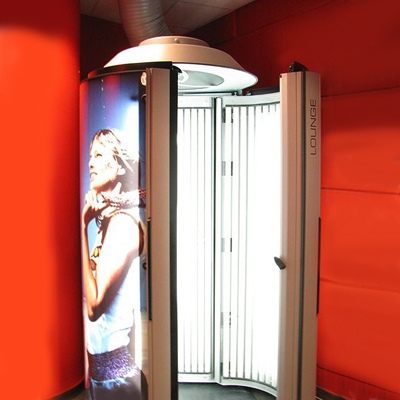 Tanning, whether outdoors or in a tanning bed, can have harmful effects on your health. In fact, the Skin Cancer Foundation states on their website that indoor ultraviolet tanners are 74 percent more likely to develop melanoma than those who have never tanned indoors. Most people are not properly informed about the risks of using tanning beds and are putting their lives at risk without even knowing it. 1) Nearly all salons (90%) denied the known risks of indoor tanning. 2) Four out of five salons falsely claimed that indoor tanning is beneficial to a young person’s health. 4) Three quarters of tanning salons failed to follow FDA recommendations on tanning frequency. The Skin Cancer Foundation, in an effort to help educate teenagers and save lives, is urging people to email letters of support urging the FDA to regulate tanning beds and ban those less than 18 year of age from using them. The SCF will then compile all emails and send them to FDA Commissioner Margaret Hamburg. You can email your letters to advocacy@skincancer.org. The Skin Cancer Foundation’s report on Congressional Report Exposes Tanning Industry’s Misleading Messaging to Teens. Watch Chelsea’s Experience with Skin Cancer to see how misleading claims by tanning salons effect the people around us. While you may already have a personal goal in mind to accomplish in 2012, have you thought about creating a New Year’s Resolution that can have a profound impact on others as well? Over 58 thousand people in the United States were diagnosed with melanomas of the skin in 2007 (the most recent year statistics are available) and the number continues to rise (Center for Disease Control). You, just one person, can help lower the rate people are being diagnosed with melanoma, the most serious form of skin cancer, and save lives. This year, consider giving back by getting involved in a race for the cure, fundraise for melanoma research, or hold an event to help educate others about skin cancer and prevention. Our friends at Melanoma Research Foundation (MRF) have some suggestions to help you get started. Go ahead – set out to accomplish something BIG this year! People often make cause related resolutions at the new year, particularly after the holidays when they feel the loss of a loved one more deeply. Often the individual will contact MRF directly with a statement along the lines of “I recently lost someone and I want to do something to help. The MRF is uniquely available to fill that need for those who lost someone to melanoma or for those who are currently battling it. The MRF has several event based programs that allow people to join our community and raise funds for research. What is attractive to the individual is that they become part of a larger group who can make a bigger impact. As one it’s hard to feel like you’re making a difference, but when you join a group that ultimately has nearly 10,000 participants a year, and raises nearly $2 million a year, then you know you’ve made a difference. Our participants take on challenges from the simple to the extreme. Many join us at our 5k Miles For Melanoma walks. Many of them will do some fundraising of their own, but most will join us to help with awareness and provide a sense of community. The more people we have at these events, the more we can make people aware of the need for sun safety and prevention. Other participants might take on more daunting challenges – running a marathon, racing in a triathlon, riding their bike across the U.S. and more. These folks all become fundraisers and bring in an average of $1200 or more. We also have supporters who focus on awareness and education activities – they often take their own time to reach out to school groups and businesses to educate them about the importance of getting a skin cancer screening, using sunscreen and promoting a better understanding of the seriousness of melanoma. It’s not “just” skin cancer. The MRF relies on our advocates and messengers to provide this valuable information to their communities. Perseverance is key to reach your goal. You can achieve great things if you are focused and motivated. Taking on a cause related resolution by yourself can be a daunting task, so create a plan to accomplish your goals and set milestones, track your progress and keep a positive ‘can do’ attitude. 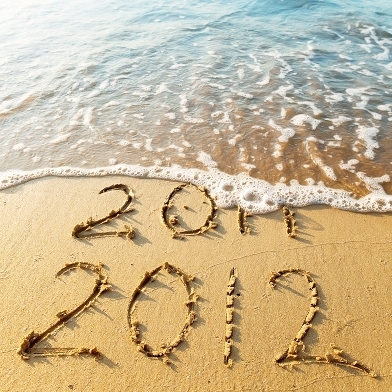 Make 2012 your greatest year yet! Skin cancer is cancer that forms in the tissues of the skin, as defined by the Center for Disease Control (CDC). So when you hear about the most common types of skin cancer which include basal cell carcinoma, squamous cell carcinoma and melanoma, what does it really mean? What are the differences between these types of skin cancers? Skin cancers occur if there’s uncontrollable growth of abnormal cells in the epidermis (outer layer of skin). The type of skin cancer, basal cell carcinoma, squamous cell carcinoma or melanoma depends on the types of cells the cancer forms in. If skin cancer begins in the basal cells, which produce skin cells that continuously push older cells toward the surface, it’s known as basal cell carcinoma. 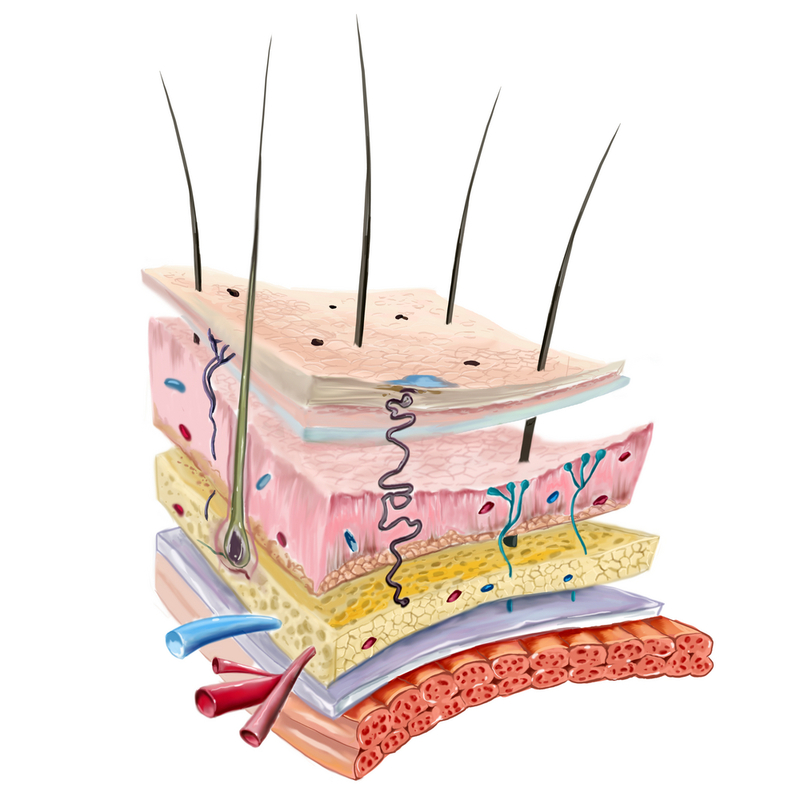 Basal cells are found in the lower part of the epidermis. This is the most common form of skin cancer accounting for an estimated 1 million of the over 1.3 million cases of skin cancer diagnosed each year according to the CDC. This type of skin cancer is usually easy to treat. Cancer that forms in the squamous cells, the flat cells that form the surface of the skin, is called squamous cell carcinoma. According to the CDC, squamous cell carcinoma accounts for about 16 percent of diagnosed skin cancer cases each year. While this type of skin cancer can be treated in most cases, if untreated it can be fatal. Skin cancer that forms in pigment cells (melanocytes) is melanoma. Melanoma is the least common form of skin cancer, but it’s also the deadliest because it tends to metastasize or spread throughout the body when not detected early. Basal cell carcinoma and squamous cell carcinoma are also referred to as nonmelanoma skin cancers to differentiate them from melanoma. Anyone can get basal cell carcinoma and squamous cell carcinoma, regardless of skin color. Factors that may increase your risk are: age, cumulative ultraviolet radiation exposure, where you live and complexion. When looking at melanoma specifically, the exact cause has yet to be determined; however, researchers argue that certain risk factors increase a person’s chance of developing melanoma including: abnormal moles, having more than 50 normal moles, fair skin, personal history of skin cancer, family history of melanoma, weakened immune system, severe sunburns and ultraviolet (UV) radiation exposure. Sun protective habits developed in childhood promote a lifetime of healthy skin. Giving a child the gift of sun protection education is as easy as ‘liking’ the Coolibar Sun Protective Clothing Facebook page. For every Coolibar Facebook page ‘like’ (a.k.a. fan) we receive in December, we’ll donate a SunAWARE book to the Children’s Melanoma Prevention Foundation. 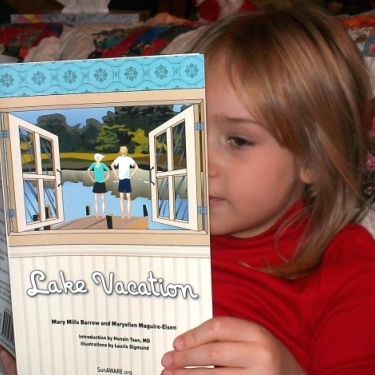 ‘Like’ us now to give a child a SunAWARE children’s book and help support our cause! Just click the ‘like’ button below. Don’t Burn. Learn About the UV Index. Looking up the UV Index is as important as looking up the weather online or watching the morning forecast every day. Just like the weather forecast, the UV Index forecast tells you what to wear. In addition, it indicates how you should prepare for the sun’s intensity so you can feel comfortable and keep your skin protected while outside. Over-exposure to UVA and UVB rays from the sun can cause more than painful sunburn. Repeat exposure to the sun’s harmful UV rays over time can cause premature aging of the skin and contribute to your risk of developing skin cancer. The UV Index predicts UV intensity levels on a scale of 1 to 11+, and the higher the UV Index number is, the greater risk you’re at of damaging your skin. The Index takes into account clouds and other conditions that affect the amount of UV radiation reaching the ground. LOW <2 Wear sunglasses that block 100% of UV. If you burn easily, cover-up and use broad-spectrum sunscreen SPF 30+. In winter, reflection off snow can nearly double UV strength. MODERATE 3-5 Take precautions if you will be outside, such as wearing a wide-brim hat and sunglasses that block 100% of UV and using broad-spectrum sunscreen SPF 30+. Reduce your exposure to the sun’s most intense UV radiation by seeking shade between 10 a.m. and 4 p.m.
HIGH 6-7 Protection against sun damage is needed. Wear a wide-brimmed hat and sunglasses that block 100% of UV, use broad-spectrum sunscreen SPF 30+ and wear a long-sleeved shirt and pants when practical. Reduce your exposure to the sun’s most intense UV radiation by seeking shade between 10 a.m. and 4 p.m. VERY HIGH 8-10 Protection against sun damage is needed. If you need to be outside during midday hours between 10 a.m. and 4 p.m., take steps to reduce sun exposure. A tightly woven shirt (or sun protective clothing), wide-brim hat and broad-spectrum sunscreen SPF 30+ are a must, and be sure you seek shade.Beachgoers should know that white sand and other bright surfaces reflect UV and can double UV exposure. EXTREME 11+ Protection against sun damage is needed. If you need to be outside during midday hours between 10 a.m. and 4 p.m., take steps to reduce sun exposure. A tightly woven shirt (or sun protective clothing), wide-brim hat and broad-spectrum sunscreen SPF 30+ are a must, and be sure you seek shade. If your local weather channel doesn’t announce the UV Index, you can get your local UV Index on the Environmental Protection Agency’s SunWise webpage. For smart-phone and tablet users, there are also UV Index apps available. Just search “UV Index” when in your app store. Look up your UV Index right now by entering your zip code into this UV Index widget. 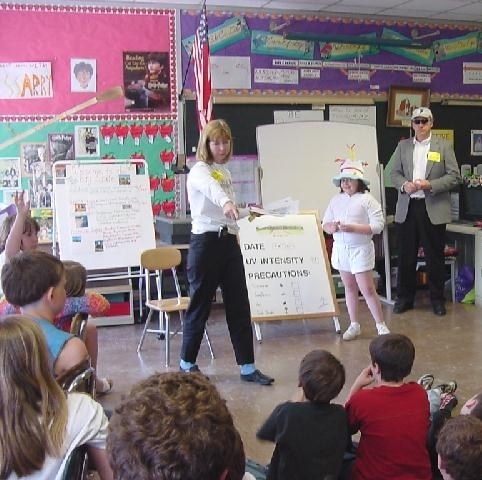 The Children’s Melanoma Prevention Foundation (CMPF) began delivering skin cancer prevention education to school children from kindergarten through grade 12 in 2003. Its founder Maryellen Maguire-Eisen believed that children needed to have a better understanding of UV intensity and sun protection. In her career as an oncology/dermatology nurse practitioner, she witnessed an alarming change in the profile of the typical skin cancer patient. Melanoma, the most dangerous form of skin cancer, was striking younger people and the numbers for all incidences of skin cancer were rising steadily. The real tragedy is that a vast number of skin cancers are preventable and easily treated when detected early. 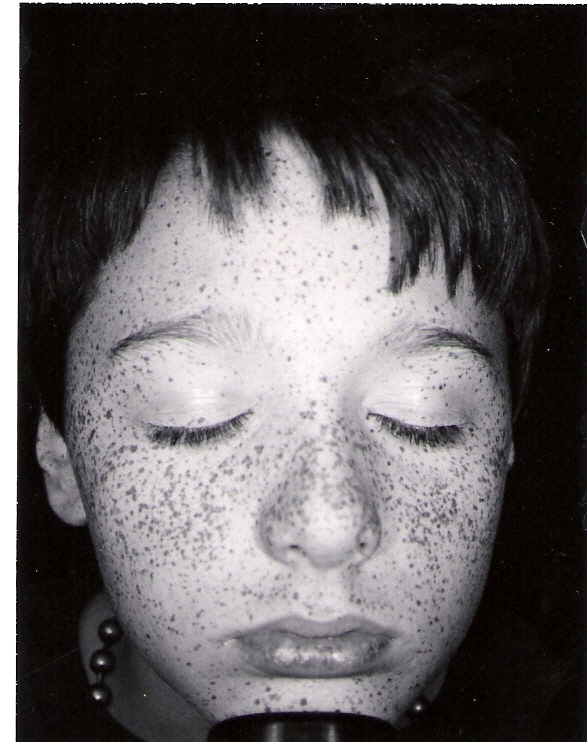 Digital photography is utilized to create specialized individual student photographs that highlight sun damage. In the eight years since its inception, the CMPF has enrolled over 100 participating schools in Massachusetts. Its team of health educators has directly taught the SunAWARE Curriculum to over 250,000 school children. Using a skin analyzer, SunAWARE educators show upper level students what their skin looks like beneath the visible surface. “Seeing their accumulated skin damage is a powerful motivator for using sun protection measures while they are still young,” says Ms. Maguire-Eisen. 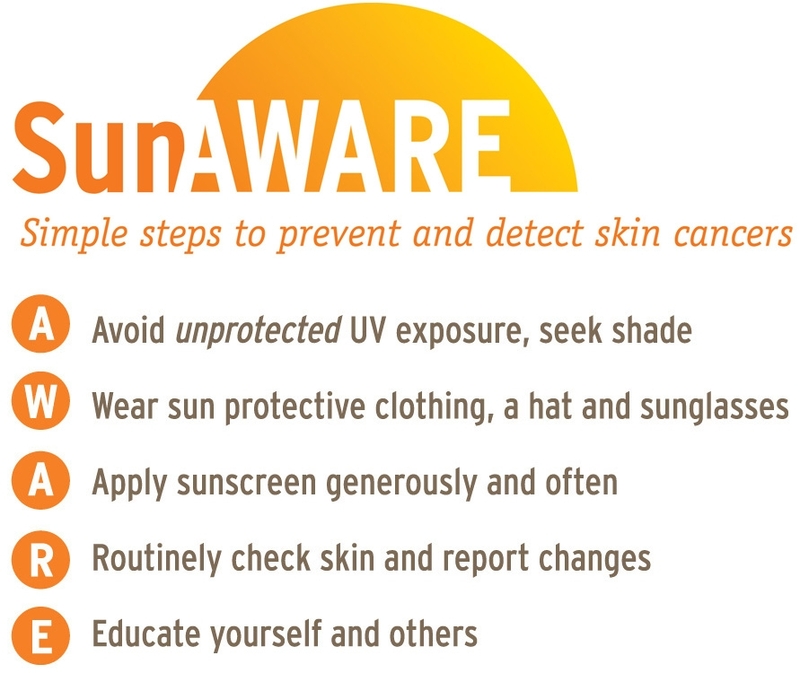 The SunAWARE curriculum has four major strands: Understanding Ultraviolet Radiation, Understanding Skin Sensitivity, Proven Methods of Sun Protection, and Skin Cancer Recognition and the SunAWARE Action Steps (seen below). There are four instructional levels: K-2, 3-5, 6-8 and 9-12. The curriculum at each level is aligned with the Massachusetts Frameworks in Health and Science. The SunAWARE curriculum for all four levels is available for download and use free of charge from CMPF’s website, http://www.melanomaprevention.org/. It is located on the Resource Center page under the SunAWARE program button. Ms. Maguire-Eisen encourages parents, teachers, health educators, school administrators, community health and wellness personnel to visit the website and use the SunAWARE Program. “Our goal is to make the SunAWARE Program available to everyone as an international resource for sun safety education,” says Ms. Maguire-Eisen. “Our ultimate goal is to protect all children from the senseless devastation of skin cancer.” Be Safe. Be SunAWARE. Wear sun protective clothing, including a long-sleeved shirt, pants, a wide-brimmed hat, and sunglasses year-round. Apply recommended amounts of broad-spectrum sunscreen with a sunburn protection factor (SPF) greater than or equal to 30 to all exposed skin and reapply every two hours, or as needed. Routinely examine your whole body for changes in your skin and report concerns to a parent or healthcare provider. Educate your family and community about the need to be SunAWARE.